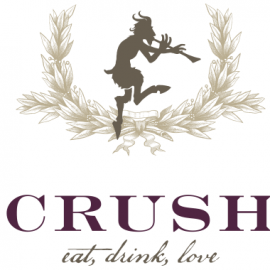 A celebration of food, drinks and friends, CRUSH offers a welcoming, dynamic setting fueled by the celebrated cuisine of Corporate Executive Chef William DeMarco and an expertly curated list of wine, spirits and beer. The restaurant is open daily for dinner. The 7,000-square-foot restaurant is divided into two rooms, each designed to transport guests to a distinctive environment. The entryway of CRUSH opens into a The Atrium, with lighting that emulates the natural migration of the sun. The doorway at the back of the garden reveals The Bodega, which is topped in its entirety by a barrel-vault ceiling composed of white brick. 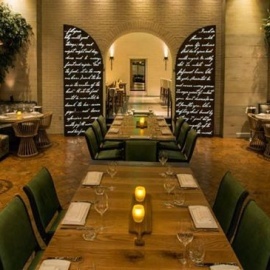 The Bodega also features a private dining room, which comfortably accommodates up to 40 guests. CRUSH offers a modern menu, with selections inspired by traditional favorites as well as standouts from regions around the world. Menu items are portioned as either small plates or larger plates, which provide indulgent portions. A selection of vegan and vegetarian options are also available.